on the same level as the Lucozade drinks of my generation. The additional ingredients Taurine, Guarana, Aspartame and Glucuronolactone to name only a few, are turning a whole generation into what I call ‘Class D drug’ addicts. Fuelled by peer pressure and multi-million-pound marketing campaigns explicitly aimed at young people, this is a major future health problem in the making. If you have never tried a can of energy drink and you have children of teenage or up and coming teenagers, then you need to know what effects these drinks have on the body. Drink a full can of Relentless and feel for yourself what your kids are or soon will be drinking. You certainly think ‘high’ and what is worrying the most, is some drinks children are having in a single day. I have witnessed kids as young as eight or nine years old drinking this stuff, and I despair at what this will do to them, as they have many more years of trying to look cool ahead of them. At the risk of sounding like an old fuddy-duddy, I feel these types of drinks should be restricted. 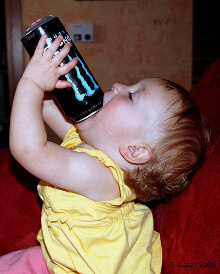 A generation of kids continually high on caffeine based drinks and the ill effects which come with not getting your daily fix, can and does, create problems for those parents who allow their kids to consume such products. Anxiety problems and mood swings. Paraesthesia (tingling or numbing of the skin). This list of symptoms looks similar to problems for much harder drugs and not something, which is freely available in every shop and supermarket in the country. The legal-high generation has never found it so easy to get a hit. All these symptoms will be affecting the child’s ability to learn because peoples natural energy levels are ironically reduced long-term and lethargic after consuming high volumes of caffeine, which obviously negates the benefits of consuming an energy drink surely? I have witnessed over the years a lot of adults who cannot get through the working day without consuming ‘energy drinks’ ironically, we are only creating a generation of what I call ‘Red Bull zombies’. If you feel the same concern as me about this issue, then educating your offspring and writing to your local MP can be the only way to change this problem. It’s not cool to be running to the toilet with diarrhoea, and your kids need to know this.